*Important - This link will direct you to www.advisorclient.com, TD Ameritrade Institutional's website for clients of registered investment advisors who use TD Ameritrade's custody and clearing platform. TD Ameritrade Institutional does not endorse or recommend any advisor, nor does it review the contents of this website. Click here to be directed to the log-in screen. 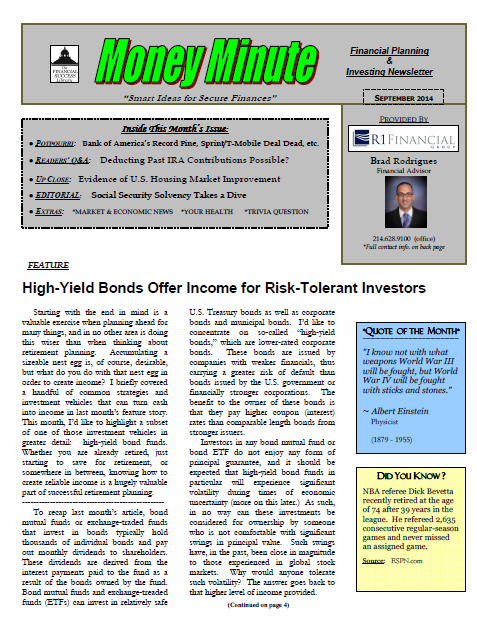 "Money Minute" is R1 Financial Group's monthly financial planning and investing newsletter written by Brad Rodrigues. Each issue contains: market and economic news, investing / retirement / financial planning articles and tips, stock news and updates, editorials, Q&A with readers, and more. Click here to view and/or print current and past issues. Timely articles, news and commentary about financial markets, stocks, and investment-related topics. Click here to view recent posts. Short videos on various financial planning-, market- and investment-related topics. Also contains practical tutorial videos for clients such as: how to navigate the TD Ameritrade online account viewer, retrieve tax forms and old account statements, updating your account settings, etc. Click here to view. A library of longer, more in-depth content about specific financial planning and investing topics such as: saving/investing for kids college education, how to create reliable, lasting income during retirement, how to invest in individual stocks, selecting mutual funds, etc. Click here to view / print current titles.